FROM THE WEST: Take 60 East (or if you are using 91 East Fwy. take interchange to 60 East / 215 South toward Indio), exit at University Ave. Turn left at light on to University Ave. Go under freeway, then past first and second light. Road will curve and become Canyon Crest Drive. Go past third light. Parking Lot 24 is on the Right. Walk to Recreation Center by making a Right turn at the corner of Linden and Canyon Crest Drive (fourth light) Recreation Center is on Linden 30 yards further on the right. Drive (third light) Recreation Center is on Linden 30 yards further on the right. FROM THE EAST: Take 60 West toward Riverside. Exit at University Ave.Turn left at light on to University Ave. Go past first light. Road will curve and become Canyon Crest Drive. Go past second light. Parking Lot 24 is on the Right. Walk to Recreation Center by making a Right turn at the corner of Linden and Canyon Crest Drive (third light) Recreation Center is on Linden 30 yards further on the right. FROM THE NORTH: Heading South on 215 Fwy. Take 215 SOUTH San Diego / 60 EAST Indio. Exit at University Ave. Turn left at light on to University Ave. Go past first and second light. Road will curve and become Canyon Crest Drive. Go past third light. Parking Lot 24 is on the Right. 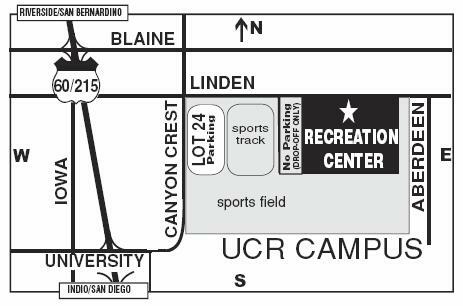 Walk to Recreation Center by making a Right turn at the corner of Linden and Canyon Crest Drive (fourth light) Recreation Center is on Linden 30 yards further on the right. Coming from the Airport: Take 10 East to 15 South. Exit onto the 60 East toward Riverside and follow directions FROM THE WEST (above). Parking in Lot 24 is All Day for $6.50. 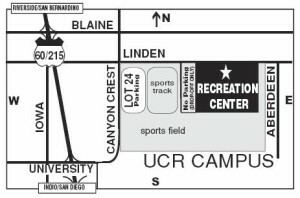 From there, it’s a short walk to the UCR Recreation Center. There is a limited amount of free local street parking near campus. You are welcome to drop-off and pick-up at the Recreation Center parking lot as long as at least one person remains with the car.